On Sunday, November 20, 826 Valencia’s writing lab was filled with excitement, but this time, it wasn’t from the young people who usually frequent this space, but from adults! During yesterday’s adult writers’ seminar on food writing, the audience got a first-hand look at food writing from a panel that answered each question not only with candor and thoughtfulness, but also with generous helpings of well-timed humor. The panel included Anthony Myint and Karen Leibowitz (co-authors of Mission Street Food) Pim Techamuanvivit (founder of Chezpim.com and author of The Foodie Handbook) and Chris Ying (editor-in-chief of Lucky Peach) alongside a warm and well-informed moderator, our very own Mary Schaefer (vice president of 826 Valencia’s Board of Directors and a volunteer since 2003). 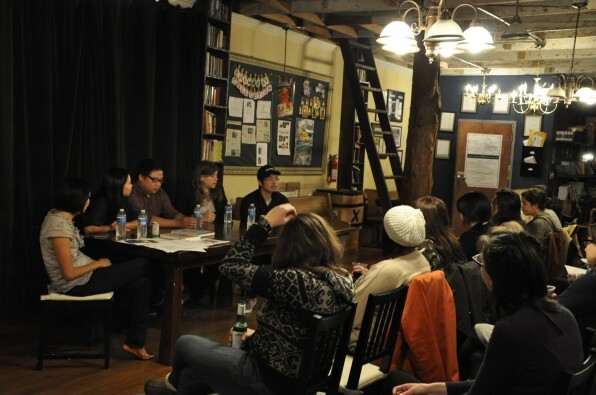 Though the evening highlighted each of the panelists’ unique approaches to food writing and the successes found in each of their respective processes, there were a couple of overarching themes that seamlessly wove the panelists’ narratives together. Food writing is best done with integrity and passion as guiding principles, a moment or a journey is the nucleus of some of the best food writing, and it’s important to consider the transition from artistic hobbies to professional lifestyles, to name a few. The evening was a perfect combination of thoughtfulness, insight, and buoyancy. The event would not have been a success without the participation of an honest, sincere, and savvy panel, and an engaging moderator, all of whom donated their time. Stay tuned for more spirited and inspiring adult writers’ seminars where no details are spared and all pertinent secrets are revealed. Thank you Pim, Chris, Anthony, Karen, Mary, and our audience for supporting 826 and spending the evening with us.